We are here to help however we can with your advertising needs. 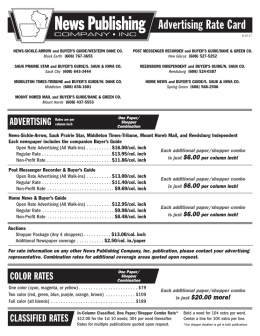 The Post Messenger Recorder is a weekly newspaper with an average circulation of 1,800 per week. Our primary distribution is the Belleville, Monticello, and New Glarus communities. To advertise, please contact Karin Henning at (608) 358-7958 or email khenning@newspubinc.com. Our regular advertising deadline is Wednesday at 2pm. The deadline may change if there is a holiday.